The kick-off time of Whitby Town’s pre-season friendly with local rivals Scarborough Athletic has been moved forward by two hours. The fixture, which is scheduled to take place at the Turnbull Ground on Saturday August 6, will get underway at 1pm, rather than 3pm, due to it clashing with the club’s Coastline Music Festival, which takes place on the same day. The event, which features 1970s favourites 10cc and The Real Thing, is being held at The Stables at Cross Butts, with the aim of raising funds to boost the Blues’ coffers. Town chairman Graham Manser said: “ There has been a lot of interest in our event, and now with less than eight weeks to go, things are starting to come together. “We’ve made the decision to bring the kick-off of the Scarborough game forward due to supporter demand – many of our fans who will be at the game have also bought tickets for the festival. “We feel we have pulled off a real coup as The Real Thing and 10cc are still at the top of their game. “Graham Gouldman is fronting 10cc, plus Chris and Eddie Amoo with Dave Smith are still the main players in The Real Thing all these years on. Town’s clash with Boro brings to a conclusion the club’s pre-season campaign. They get underway with the visit of South Shields on July 17, before a Middlesbrough FC XI come to the Turnbull on July 20. Chris Hardy is set for a return to his old stomping ground on July 23 when the Seasiders head to Guisborough Town to contest their annual Mickey Skinner Trophy clash. 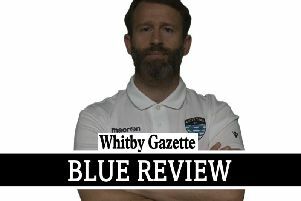 The Blues then host Marske United (July 26) and Bishop Auckland (July 30) before visiting Pickering Town on August 2.